In this modern era, we need to be aware of currency rate and those kinds of stuff. Here I am going to provide you with the best real-time currency converter WordPress plugin for the widget. 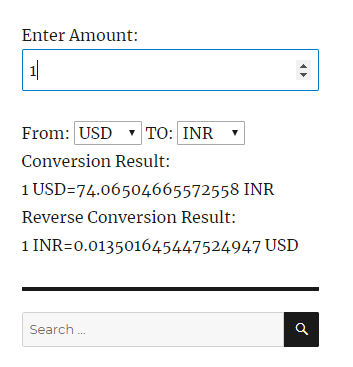 Just imagine of getting the currency conversion widget in WordPress site. But all the data are real-time. No need to wait after clicking the convert button because you don’t need to click any button. Just enter the amount or change anything. The result will be displayed instantly. If you need customization don’t worry we are always here to give you the best support. Moreover, Optimized code to give you the faster experience. Go to https://fixer.io and create an account to get the API key. 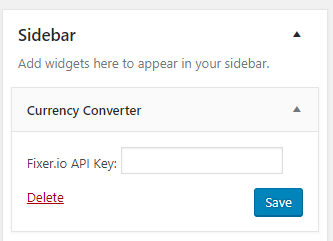 Finally, Drag the currency converter widget to anywhere you want and put the API key in the box.